Is it a rat or is it a squirrel? 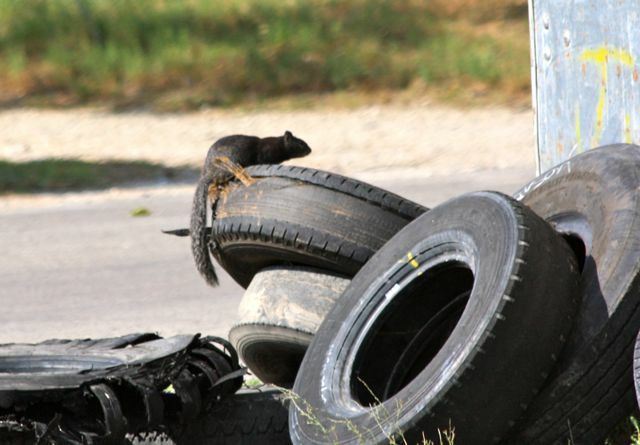 We caught this fellow chewing on some tire tread today. Not sure if it is a rat that mated with a squirrel or a squirrel that looks like a rat. He was very dark, almost black and his face is more pointed then a squirrel. Makes you wonder? Ewww! He’s ugly & I don’t want him to be near me — I’ll settle for “Miss Piggy” any day! Uh, ruirrel. Or squirat. Yeah, that’s it! Squirat.